Nice more French napoleonic and Russians.can’t wait.thank you strelets. I think maybe the left hand figure could be polish I hope so still waiting for the polish artillery set to come along. 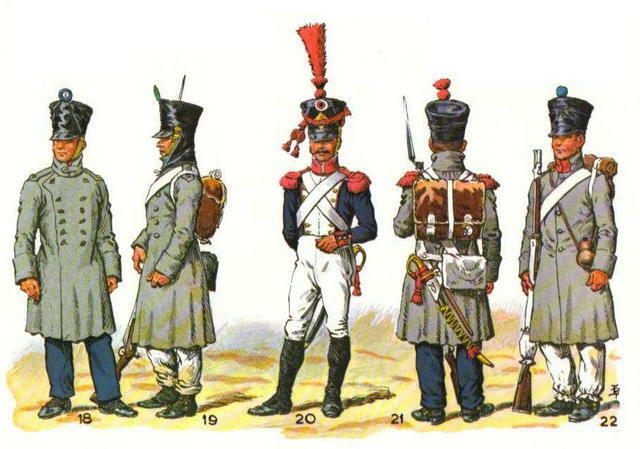 Definitely not polish or saxons but looks like pre baradin 1812 uniforms.if i remember corectly only one division who went to russia in 1812 had new 1812 baradin uniforms.rest had early pre1812 uniforms looks like soldiers for borodino it was fought on 7 september 1812 so it wasn’t cold that day.elites hoply strelets will make fusiliers too.greetings. These have to be Set 197 French Infantry in Summer Dress Standing at Ease as advertised on the sides of the recent batch of boxes, only there is a problem these have two cross belts which would mark them as Elites such as Grenadiers or Light Infantry except they have no epaulettes or plumes, if they had just one cross belt they would be Fusiliers, so I think Strelets may have made an error in their research hopefully it's not to late to change things. The Elites wore sword and bayonet scabbard on a cross-belt over the right shoulder and cartridge box other the left shoulder, the Fusiliers wore the cartridge box and scabbard on a single cross-belt over the left shoulder only, both would of had some kind of water bottle other the right shoulder but on a thin strap and not a cross belt. Having said that the quality of sculpting is once again excellent. I have to concede these must be Elites with no plumes in campaign trousers, which leads me to ask will there be any Fusiliers the most common form of French infantryman and much more in demand than the Elites which have been done many times before, I would not mind if the boxes contained both but would expect there to be two Fusiliers to every one Elite figure. Re: Friday Model PLEASE STRELETS CAN YOU ADD MISSING EPAULETS? Ow yes they are missing epaulets.Please strelets add epaulets.can you make it correct or is it too late? And please, if they are supposed to be french. The pompon was never covered, always visible. Re: Friday Model—barking up the wrong tree? At first glance, I thought that the right-hand figure looked Russian, but it did not look quite right. Checking Viskovatov's "Historical Description of the Clothing and Arms of the Russian Army" (translated) suggests that a covered kiver (shako) did not come into use until 1817. I suspect that Steve H (above) is correct and it is a czapka. It's always difficult to tell from a single image. Sorry to disappoint you but polish had different uniforms dinstictive kurtka not like french and czapka if will be present on those figures then its incorrect uniform.early some polish troops used cpitured austrian and prussian uniforms and they adjusted them to distinguish themself from others.as time passed (wore out uniforms)they changed them for new ones which in 1810-14 had different lapels compared to french jacket. True and good point, I was not focussing on the waist-coat, silly me. I'll be interested to know what he is then. Perhaps the camera angle makes the shako look like a Russian kiver? On a separate issue is your new venture the production of buildings / terrain? It’s ok nobody can be focused 100% all the time.it happens to me too.yes It must be camera angle because when you look at figure stand you can see bottom of the stand.so shako looks different.but still missing pompon first figure,both figures missing epaulettes should be corrected unless they’re some napoleonic hippies :-D then excuse my french.Would be nice to have separate elites and fusiliers in separate boxes so we can buy both based on needs. 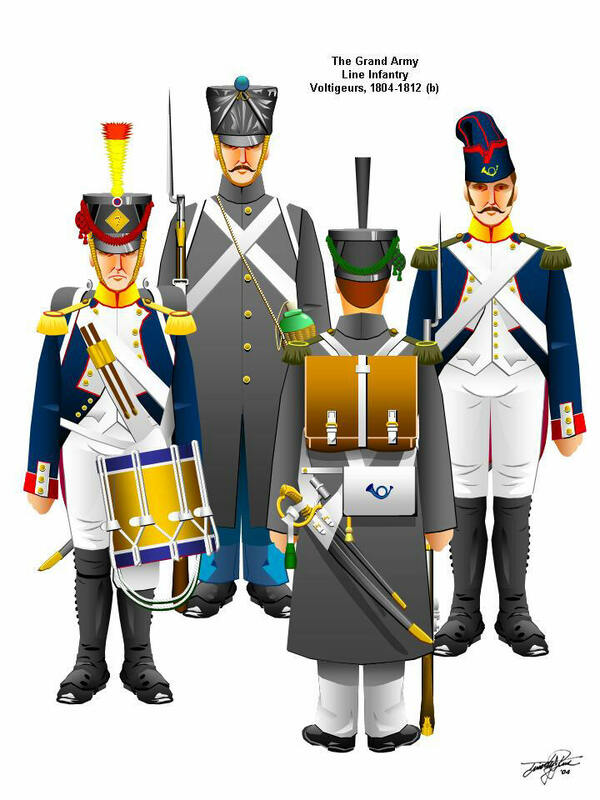 Set M011 (Russian Grenadiers in winter dress) being not available anymore for long I will be very glad to buy new sets of russian line infantry (musketier) in summer or winter dress, no matter the pose (standing, firing, at ease and so on), we need good and accurate 1812 russian fusiliers. I recentlly bought the latest strelets sets (WWII, ACW and Napoleonic) and I'm very happy with them. keep the good work coming to us !